C++11 - early days. You'll learn about all the elements of a lambda expression and even some tricks. This is the longest chapter as we need to cover a lot of topics. C++14 - updates. 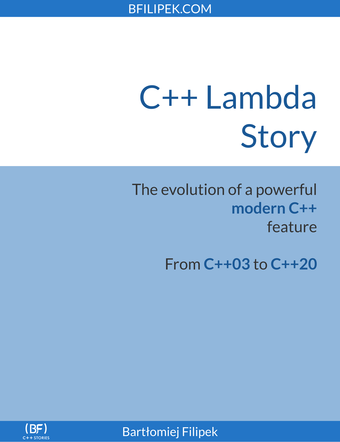 Once lambdas were adopted, we saw some options to improve them. C++17 - more improvements, especially by handling `this` pointer and allowing `constexpr`. C++20 - in this section we'll have a glimpse overview of the future. I added more examples and better descriptions to describe lambdas in a better way! The articles also are based on a live coding presentation given by C++ Expert Tomasz Kamiński at our local Cracow C++ User Group. Get your free copy directly to your email. Please note that by signing here you'll be also added to my main email list. You'll get notifications about new blog posts, additional content, promotions and other products from bfilipek.com.